More than 1,000 children returned to school in west Dublin today after serious structural defects were uncovered in their schools two weeks ago. Many children will be bussed or walked to alternative accommodation being provided in other schools. The schools affected are located in Tyrrelstown and Lucan. Around 900 children returned at Tyrrelstown's two primary schools, with approximately 300 being bussed to alternative accommodation, and another 300 will walk to classes in a nearby secondary school. 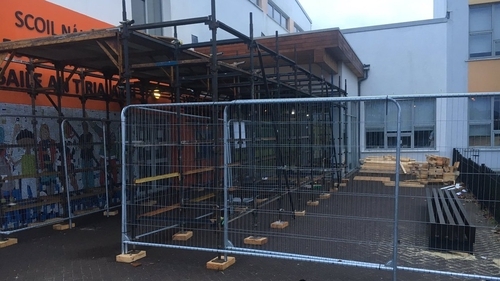 A further 300, who are the youngest pupils at Tyrrelstown Educate Together National School, will have classes on the ground floor of their school building, where the walls and some corridors have been buttressed by scaffolding and timber structures. Meanwhile, St Luke’s school in Tyrrelstown will reopen the ground floor to junior pupils tomorrow. On its website the school told parents that it was satisfied as to safety after a second health and safety check. A Gaelscoil in Lucan, Eiscir Riada, which has similar problems, opened to junior pupils last Monday. Its senior pupils returned to school today and are being bussed or walked to alternative accommodation.